I snagged this recipe from The Stay at Home Chef blog site a few months ago and have had it on my recipe must try list ever since. Yesterday was the day. I adore real Latin American food. No - it's not burritos and enchiladas smothered in a 1/2 inch deep layer of cheese, guacamole and sour cream. That's the U.S. Tex Mex style of cooking. True Latin American cooking allows the ingredients' flavours to stand out. It's cleaner and full of visual appeal. Burritos and enchiladas are offered in a simpler way than the U.S. Tex Mex style. Rice and beans are side accents and meat entrees offer small, warm rolled up tortillas to complete the meal. Carne Asada is Spanish for "grilled meat." It's a Latin American dish of sliced beef, usually sirloin steak, tenderloin steak or rib steak, that is usually cooked with a certain amount of searing on the BBQ to impart a charred flavor. 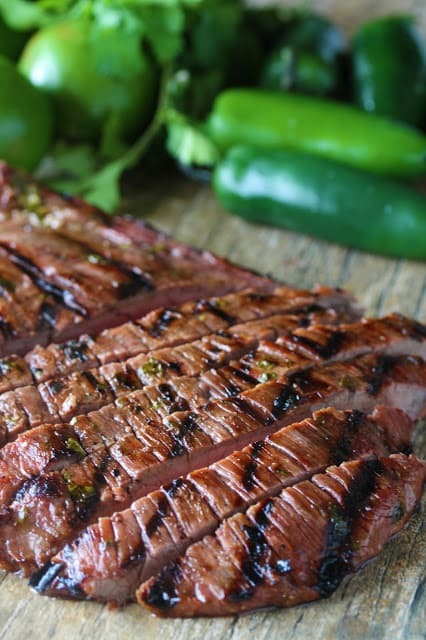 The marinade for this version using flank steak (also called skirt steak) is filled with citrus and the single jalapeno is quiet background touch. If you're looking for spicy, you'll have to add a lot more. Then cooking on the BBQ gives the meat that extra charred hit of flavour that is essential in my opinion. In a large Ziploc bag, combine lime juice, crushed garlic, orange juice, cilantro, salt, pepper, olive oil, jalapeno, and vinegar. Squeeze it around to mix it up. Add the flank steak and squish it around some more to make sure the meat is well coated with the marinade. Squeeze out all the air and seal the bag. Refrigerate for at least 2 hours or overnight. I did it for the 2 hours this time, but next time will let it marinade overnight to absorb more of the flavors. I also occasionally flipped the bag over to make sure the steak marinaded evenly. Heat your BBQ. (note - The original recipe says to high heat. We did ours a bit lower as I don't like my meat to have any pink in the middle. So had to turn it down a bit.) Cook on the grill for 7-10 minutes a side (or until the doneness your family prefers). Let rest 10 minutes covered and then slice into thin strips ACROSS the grain. (note - As mine was cooked to a very done state, I was able to slice mine almost right away.) Serve with small warm tortillas and your favourite side dishes.